C-22 Casing Spools are designed with a straightbore bowl that prevents damage to sealing areas from drilling tools and prevents test-plug and bowlprotector wedging problems under pressure. 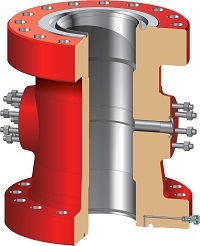 This straight-bore design also reduces maintenance costs and permits suspension of heavy casing loads. C-22 Casing Spools normally are furnished with studded outlets, but optional threaded outlets are available upon request. Bottom preparation can include PE seals or X-bushing secondary seals. HPE seals for high-performance frac wells are available upon request. C-22 Casing Spools allow interchangeability between C-22 and C-21 Casing Hangers. The C-29 Casing Spool uses a straight bore based on the same reliable design as the C-22 except the bowl is 2 inches deeper, permiting the acceptance of the minimal-deflection C-29 Casing Hanger. This allows extreme-load casing-hanging capacity compared with the C-22 profile. C-29 Casing Spools normally are furnished with studded outlets, and threaded outlets are available upon request. Bottom preparation can include PE seal or X-bushing secondary seals. HPE seals for high-performance frac wells are available upon request..